According to the ancient tradition of Feng Shui, the environment in which we live in possesses an amazing influence on our health, success and our happiness. Therefore, the way we furnish our home’s interior – furniture, decorations, colour of the walls, unique characteristics of doors and windows, has tremendous impact on the flow of energy (the chi) through our abode. The following image is the Chinese Pa Kua octagon. Feng Shui classifies an individual’s aspects of life into eight pies (symbolised by the cardinal points) which can be improved on, such as wealth, career, love, health, knowledge, etc. 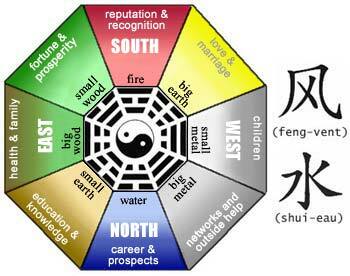 This test will allow you to better understand this centuries-old art form known as Feng Shui. It will reveal how you can use it to your advantage and eliminate certain unhealthy elements present in your life: bad luck, financial problems, relationship issues, etc. This test was developed by a Feng Shui expert from Hong Kong. This test will also give you access to a 25-page personalised report which lists in detail the Feng Shui characteristics of your home and will provide you with tips and advice on how to improve your quality of life.